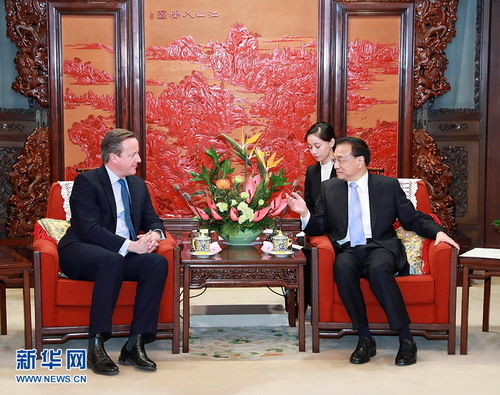 BEIJING, Nov. 27, Chinese Premier Li Keqiang met with former British Prime Minister David Cameron in Beijing Tuesday, saying China stands ready to work with Britain to strengthen bilateral ties in order to benefit both countries and peoples. During their meeting at the Zhongnanhai leadership compound in Beijing, Li spoke highly of Cameron's contribution to China-Britain ties when he served as British prime minister. China attaches great importance to its relations with Britain, Li told Cameron, saying that China is ready to work with Britain to consolidate political mutual understanding, enhance cooperation in key areas such as the economy, trade and finance and further tap potentials of investment to make bilateral cooperation yield more win-win results and better benefit both peoples. Noting that the world has paid a lot of attention to the agreement between Britain and the European Union (EU) on the Brexit deal at present, Li said China is glad to see a peaceful, stable, prosperous and open Britain and EU as both of them are China's important partners. China will continue to promote the healthy and steady development of China-Britain and China-EU ties and would like to jointly uphold multilateralism and free trade and realize mutually beneficial cooperation, said Li. Cameron said with both sides' efforts, Britain-China relations entered into a golden era while he was in office. Hailing the enhanced bilateral cooperation and increasing growth of two-way investment and trade, Cameron said Britain will firmly support rules-based multilateralism and free trade as always.